Banana Pudding Poke Cake is one of the easiest and most divine cakes you can make! Incredibly creamy and with lots of banana flavor! Making high quality Poke Cakes is our obsession. We love Poke Cakes that are easy to make, look stunning and taste delicious, like our popular Strawberry Poke Cake, German Chocolate Poke Cake and Pumpkin Poke Cake. 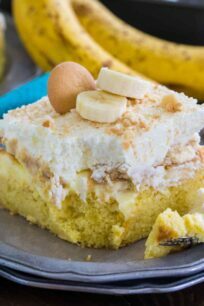 Banana Pudding Poke Cake is such a luxurious and creamy cake, that all the banana lovers will go crazy for it! I am a huge fan of poke cakes, and while I had my fair share of poke cakes, I can probably safely say that this one is my top favorite. This cake has such a perfect light texture, that it almost feels like a creamy cloud of banana pudding and sweet whipped cream. Using a cake mix will reduce the prep time. You can use Yellow Cake mix or White Cake mix. However, if you want to add some fun, a Funfetti Cake mix will work too. Bananas must be ripe, but not very brown for this recipe. Keep the cake refrigerated because the frosting will soften if kept at room temperature for too long. For more texture, you can add one 1/2 cup of finely chopped pecans or walnuts into the cake. You can use either vanilla pudding or banana pudding, I like using banana pudding for extra banana flavor. Clean the knife after each cut, otherwise the slices will be messier, since the frosting may stick to the knife. Don’t have Nilla Wafers? Even vanilla flavored animal crackers will work. HOW TO FREEZE THE BANANA PUDDING POKE CAKE? If freezing the cake without adding the frosting, then first wait for cake layer to cool completely. Fully wrap in plastic wrap tightly. Next, wrap in aluminum foil or place it in freezer bags. Prepare yellow cake mix according to box instructions. Pour batter into the prepared pan and bake for about 25 minutes, or until a toothpick inserted in the center comes out clean. Let cool for 10 minutes and using the bottom of a wooden spoon, poke holes all over the cake. Prepare the banana pudding: in a medium bowl, whisk together pudding mix and milk until thick. Once thick, pour it over the cake, into the holes. Spread well using a spatula. Top the cake with the slices bananas all over the cake, slice more bananas if needed. Top the bananas with a layer of Nilla Wafers. 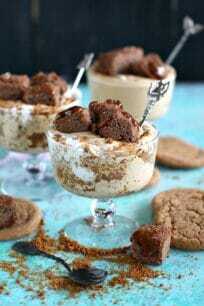 Spread whipped cream on top and sprinkle all over with crushed and whole Nilla Wafers. 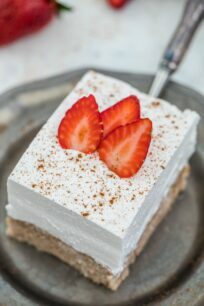 To keep the layer of wafers in place, I like to add large dollops of whipped cream all over the surface of the cake, and after that, gently spread the cream using a spatula. Refrigerate the cake for at least 8 hours or better overnight. 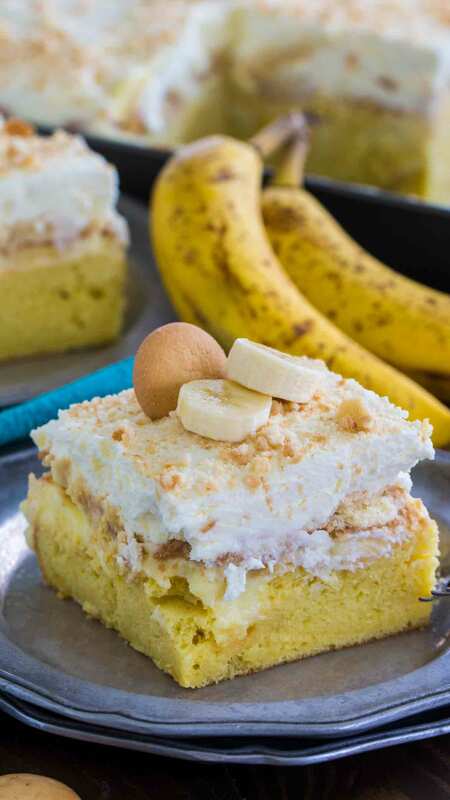 Slice and serve garnished with Nilla Wafers and sliced bananas. This looks like a cake my family would eat up. We have all the ingredients I think so I should try it out! Oh my husband would love this. He loves banana pudding with bananas and wafers in it. Its something he enjoyed since childhood and whenever I make it, it makes him happy. I think I’ll have to make this version instead though. 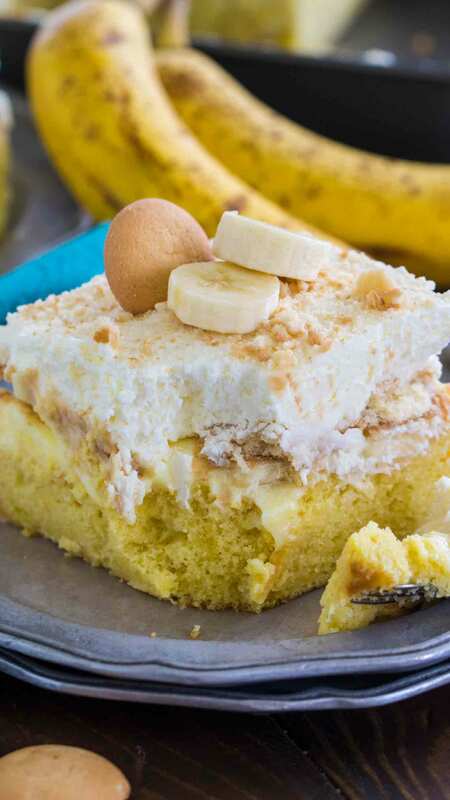 This is just an amazing cross between a poke cake and a banana cream pie. Excellent! My favorite desserts all in one… I’ll definitely be making this. I love banana pudding and this cake looks like it’s so easy to make. I definitely want to try this recipe. I bet my kids would love this too. This looks crazy awesome good. You say it serves 12 but I am here to tell you that it MIGHT serve two. 🙂 I want to try it with my meatloaf dinner this weekend. This banana pudding poke cake does look easy to make. It looks so creamy and fluffy. Absolutely mouth-watering. Poke cakes are so yummy and FUN! I love the idea of a banana poke cake – that sounds good right now! I will have to make one! This looks amazing! Banana everything is my favorite. I have to make this! This looks amazingly good. I wonder if I could make it as a dairy free, vegan option… My kids would love it. VA RECOMAND SA INCERCATI…..SE MERITA!MERSI P/U SUGESTII…. I have never tried a poke cake, but it sounds delicious. I’m not a fan of a lot of traditional cakes that are just kind of spongy, and this sounds a lot richer and fudgier. I’d love to give this a try! I have never had this kind of cake before. It sure does look amazing too. I need to give it a try soon. Yum!! This is so good, this will be a huge hit!This is so good, this will be a huge hit! Wow that looks so good! I could go for a piece of that right about now! This looks amazing! I want to try making this after I’ve finished my diet. 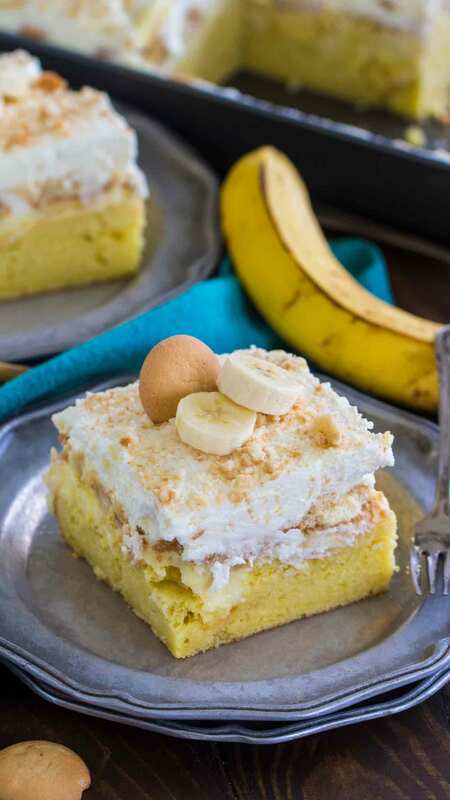 My little monkeys will go bananas for this Banana Pudding Poke Cake. It’s going to be perfect for a springtime celebration. Oh wow! All these poke cake recipes are making me hungry. Banana, Bailey’s, German Chocolate Cake, Carrot Cake … yum! Oh my, I LOVE a good poke cake and this one sounds so good!! I need to make this ASAP!! That Banana Pudding Poke Cake sounds really yummy and delicious. Love to try the Carrot Poke Cake recipe too! This sounds delicious. I just love poke cakes. All that flavour all the way through the cake. YUM! I made some banana pudding a few weeks ago. It’s one of our fave desserts. Never tried preparing banana pudding poke cake though. It looks good! This is one of my favorite desserts! 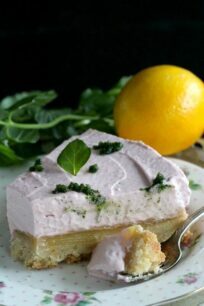 I just love how the banana flavor gets into everything and when the cake is moist and airy it’s out of this world! Top it with buttercream, oh what do you like? What kind of milk do you use? All we drink is almond milk but I’m assuming dairy? Skim? 2%? Whole? Thank you! I usually use whole milk in recipes.